AutoCAD MEP 2016 for Designers textbook is written with the intention of helping the readers effectively use the designing and drafting tools of AutoCAD MEP 2016. 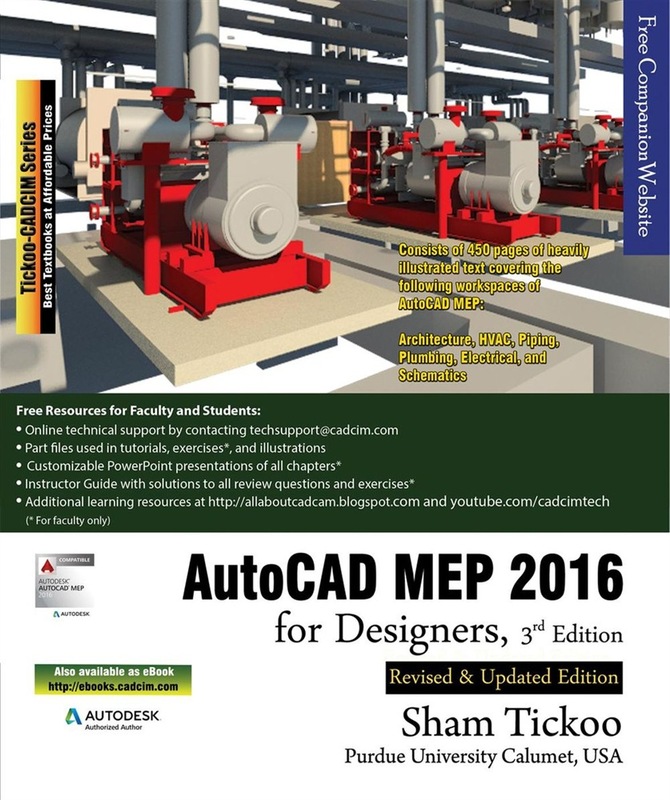 This textbook provides a simple and clear explanation of tools that are commonly used in AutoCAD MEP 2016. After reading this textbook, you will be able to design HVAC system, piping system, plumbing system, and electrical layout of a building. The chapter on schematics will enable the users generate the schematic drawings of a system for easy representation. The examples and tutorials used in this textbook ensure that the users can relate the knowledge from this textbook with the actual industry designs. Since AutoCAD MEP is based on AutoCAD platform, a user must have basic knowledge of AutoCAD. In this textbook, the basic tools of AutoCAD are not explained while explaining the working of MEP tools assuming that the user knows AutoCAD basics. The main features of this textbook are as follows: • Tutorial Approach The author has adopted the tutorial point-of-view and the learn-by-doing approach throughout the textbook. This approach guides the users easily understand the process of designing and drafting with the help of tutorials. • Real-World Projects as Tutorials The author has used about real-world mechanical engineering projects as tutorials in this textbook. This enables the readers to relate the tutorials to the engineering industry. In addition, there are exercises that are also based on the real-world engineering projects. • Tips and Notes Additional information related to various topics is provided to the users in the form of tips and notes. • Heavily Illustrated Text The text in this book is heavily illustrated with about 400 line diagrams and screen capture images. • Learning Objectives The first page of every chapter summarizes the topics that are covered in that chapter. • Self-Evaluation Test, Review Questions, and Exercises Every chapter ends with Self-Evaluation Test so that the users can assess their knowledge of the chapter. The answers to Self-Evaluation Test are given at the end of the chapter. Also, the Review Questions and Exercises are given at the end of each chapter and they can be used by the Instructors as test questions and exercises. 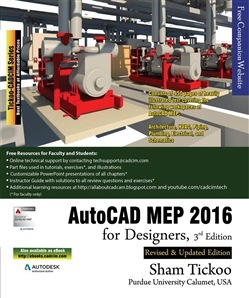 Acquista AutoCAD MEP 2016 for Designers in Epub: dopo aver letto l’ebook AutoCAD MEP 2016 for Designers di Prof Sham Tickoo ti invitiamo a lasciarci una Recensione qui sotto: sarà utile agli utenti che non abbiano ancora letto questo libro e che vogliano avere delle opinioni altrui. L’opinione su di un libro è molto soggettiva e per questo leggere eventuali recensioni negative non ci dovrà frenare dall’acquisto, anzi dovrà spingerci ad acquistare il libro in fretta per poter dire la nostra ed eventualmente smentire quanto commentato da altri, contribuendo ad arricchire più possibile i commenti e dare sempre più spunti di confronto al pubblico online.